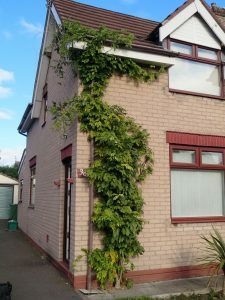 In this episode of The A-Z of Damp from Atlantis Damp & Timber Proofing Specialists Ltd. G is for…… Gardens in your Gutter (causing internal damp). We recently visited a property in Northwich, Cheshire to survey for damp detected on walls internally. A young family had been quoted over £5,000.00 to remedy a reported rising damp problem in their home. They felt this quote was too high and as such were getting some comparisons. One of their friends recommended speaking to us to get a reliable, honest advice from a CSRT expert. They were right to get a second opinion. There was no rising damp. Using a surface moisture meter, it was identified that there were no readings at skirting board height, or up to a meter high (which would be typical of rising damp). There were, however, high moisture readings. These were in the corners of the rooms at both the front and back elevations on the ground and first floor at ceiling height. An external inspection revealed that the gutters were severely blocked with debris. There was green staining and algae on the wall next to the downspout. This fault corresponded exactly to the dampness that was detected internally. Furthermore, a blocked gutter can cause damage to your downspouts and water to build up and enter the property. The specialist term for this Penetrating Damp. If not repaired, it could also lead to roofing problems, which can, again lead to damp issues internally. As with any damp issue in your home, this could result in thousands of pounds worth of repairs as if you leave it unchecked. Wood rot in your structural timbers can occur. Gutter and downspout blockages will always happen in your property, sometimes more regularly if your home is surrounded by trees. If you included clearing the gutters in your annual home maintenance plan it will never become a significant issue. As with all types of damp, if you can prevent penetrating damp through water penetration due to leaking gutters is so much more effective than treating it. To do their job, your gutters and downspouts must be clear of leaves and debris. If they aren’t, drain outlets will dam up and rainwater will fill the gutters, overflow, and eventually pull the gutters loose. During a rainstorm, gutters route runoff from a very large surface—a home’s roof—to where it can drain away from the house. By doing so, they protect walls, windows, doors, and foundations from water damage and help prevent flooding in basements. If your gutters are blocked, they will fail to do the job that they were intended for – directing rain water away from your house and into your drains. Depending on how hard the gutters are to reach, you can now contact a company to complete this task for you. If you prefer, and it is safe to do so, you can do it yourself. To clean out your gutters you will need: a trowel, ladder, buckets, garden hose, gutter cleaning attachment and gutter sealant. Next you could watch one of the many youtube videos (try https://www.youtube.com/watch?v=-zFoynqYkCM) on this subject that you could check out for more information on a DIY job. Have a chat with a family run business to get to the root cause of the dampness in your home. We feel confident that we can help you by carrying out a survey of your property. Simply contact us at Atlantis Damp Proofing & Timber Specialists Ltd for our expert opinion to ensure accurate diagnosis and solutions to your property problem. What are the signs of damp in my home?